When I first bought my house I didn't have a mower, someone gave me a cheap lawn mower that worked for a while but after it kicked the bucket I needed to look for something new. I wanted something reasonably priced and reliable but I live in town and don't have an exceptionally large yard so I didn't need anything too big or two fancy. I ended up buying the Husqvarna 5521CM push mower and absolutely love it. I'm not particularly mechanical, so the fact that it is easy to use and starts up right away every time makes it perfect for me. I absolutely love that it starts on the first pull for me. It has the option to bag or mulch and I use both depending on the season but in the fall, i absolutely love the bag option to mow up my leaves to till into my garden. It saves me a lot of time in raking. The bag isn't very large so if you are planning on mowing a large space you would need to empty it frequently, but for small yard, the amount of bag emptying I do is perfectly acceptable to me. I've put this mower to the test after coming home from vacation to find long out of control grass. This machine never hesitated and mowed through the thickest and wettest of the grass without a hitch. This mower is not self propelled but I prefer that. It is lightweight enough that pushing it is not difficult at all. 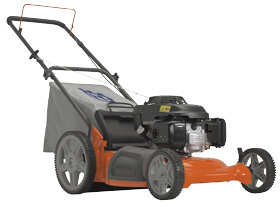 This is Husqvarna’s entry level mower and doesn’t have any bells and whistles but if you are looking for a reliable affordable quality lawn mower for a small to average yard, this would be a great option. What got me was that it was built with a Honda motor which I liked. The overall build of this mower is alright, not stellar, but it will do the job. Its a no frills mower without all the bells and whistles. The only quality issue I have run across was that if you lift the wheels off the ground, and spin the wheels while its suspended in the air, the wheels wobble pretty bad. I checked this on every Husqvarna in the store and all of them did this no matter which model, from the cheap mowers to the really expensive ones. I would be happy if the Honda motor on my 5521CM would just start. I bought it, took it home, and mowed once, after which it quit starting. Took it back to dealer, who told me there was dust in the carburetor now it's working. (Duh! I was cutting GRASS, which grows on dirt, which is dusty)! Took the dratted thing home and it wouldn't start at all, ever. It's still sitting in my garage, because I was still in mourning for my late husband. Couldn't face conflict with a dealer. Today i feel better and am about to invoke the North Carolina lemon law to seek redress. It's a piece of junk and I'll never buy from Honda/Husqvarna again. I love this product. It touchs me in ways my wife can not. You have no idea what you are talking about. I wanted a good mover and was told that the Husqvarna 5521cm was the way to go. Well, I bought it and it was easy to setup ,but from there on for me it was all down hill. The front wheels are belt driven with a pulley to the shaft of the blade which means if you are cutting higher grass the glass lumps up easy, and doesn't blow out the side discharge. Which shuts down the mover .I had to keep stopping and turning the mover over to clean the grass away. You only can cut your grass with the mover blowing away from the grass your cutting if not you are not able to cut anything. I have had Sears mover where I could cut my grass in any direction but not with the Husqvarna. Even without the side shute on and using it like you were mulch blade it bogs down with easy build up.